Provided photo Barbara Cooper talked about her pop up store/ministry called Connections located at 35 E. Main St. Barbara’s background includes being a Methodist minister and she operates a music studio in the Hotel Gallery. Connections currently operates on Friday nights from 2:30-6:30 p.m. and focuses on offering middle school kids (but all are welcome) a place to go after school. They sell candy and specialty sodas. Pictured is 2018-2019 Rotary President Corey Vaughn, Barbara Cooper, and her dog Bailey. Barbara Cooper talked about her pop up store/ministry called Connections located at 35 E. Main St. Barbara’s background includes being a Methodist minister and she operates a music studio in the Hotel Gallery. Connections currently operates on Friday nights from 2:30-6:30 p.m. and focuses on offering middle school kids (but all are welcome) a place to go after school. They sell candy and specialty sodas. Pictured is 2018-2019 Rotary President Corey Vaughn, Barbara Cooper, and her dog Bailey. https://www.weeklyrecordherald.com/wp-content/uploads/sites/51/2018/09/web1_1537979603368.jpgProvided photo Barbara Cooper talked about her pop up store/ministry called Connections located at 35 E. Main St. Barbara’s background includes being a Methodist minister and she operates a music studio in the Hotel Gallery. Connections currently operates on Friday nights from 2:30-6:30 p.m. and focuses on offering middle school kids (but all are welcome) a place to go after school. They sell candy and specialty sodas. 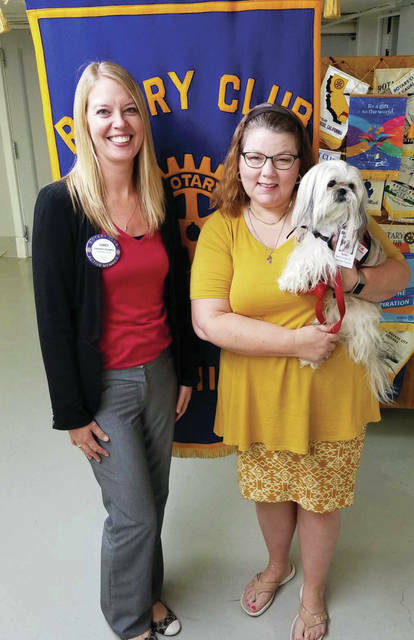 Pictured is 2018-2019 Rotary President Corey Vaughn, Barbara Cooper, and her dog Bailey.